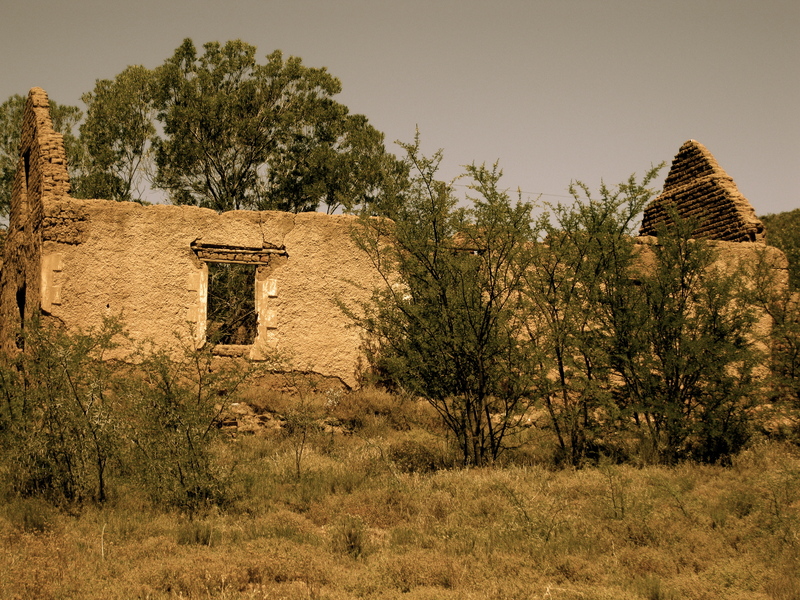 We started the trip at 6:30 in the morning after waking up fairly early due to the fact that some of the windows in the accommodation only had lace curtains but it was a good thing as it allowed us to get on our way. 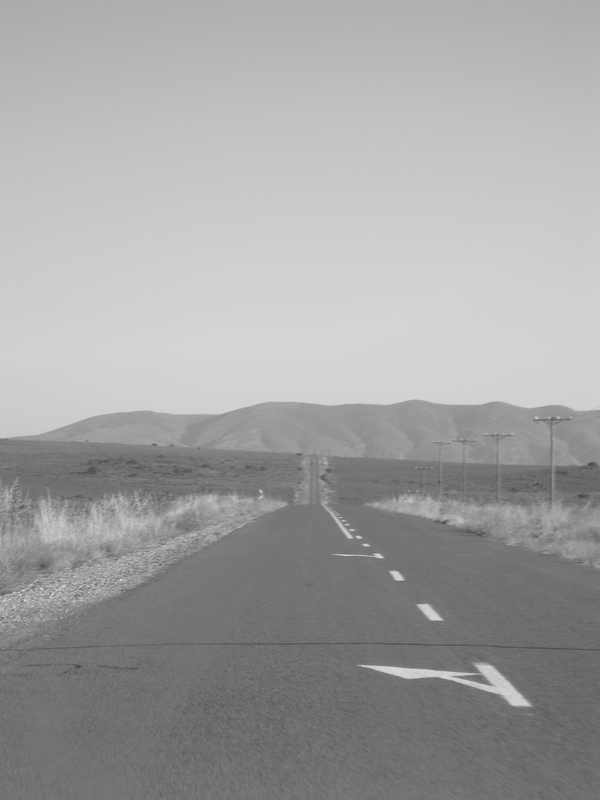 The Drive from Uniondale to De Rust rather straight forward will loads of dry land and mountians in the distance. 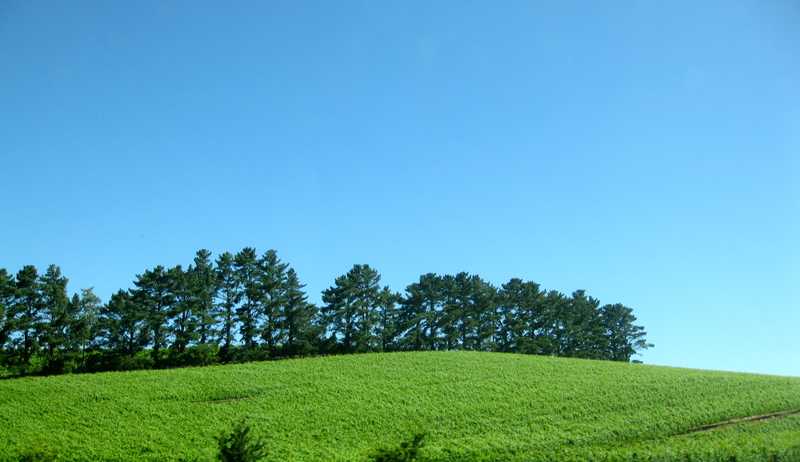 As we came near to De Rust there were fields of beautiful purple flowers and i had to stop to take some pictures. As soon as i got out the car I had a very sneaky suspicion what i was looking at due to the smell in the air. 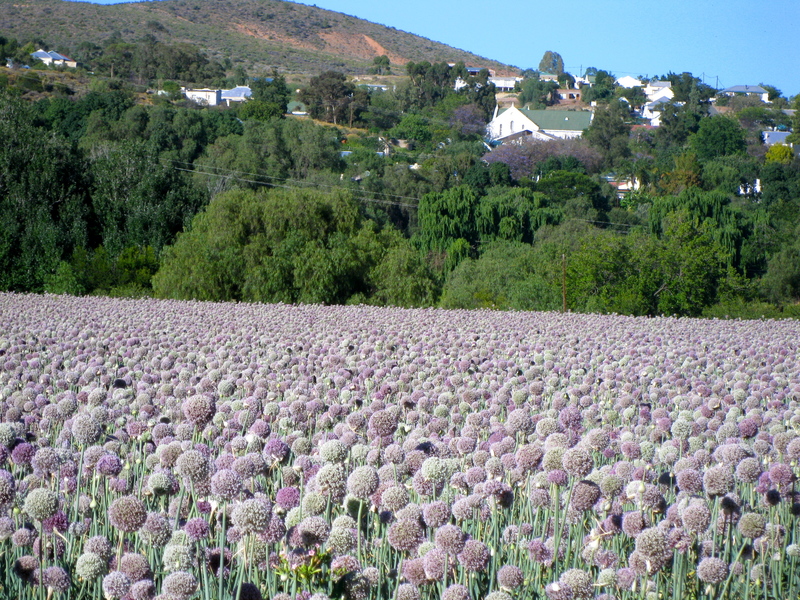 It was loads of onions which were flowering, beautiful purple ball shaped flowers, nice to look at but rather smelly. 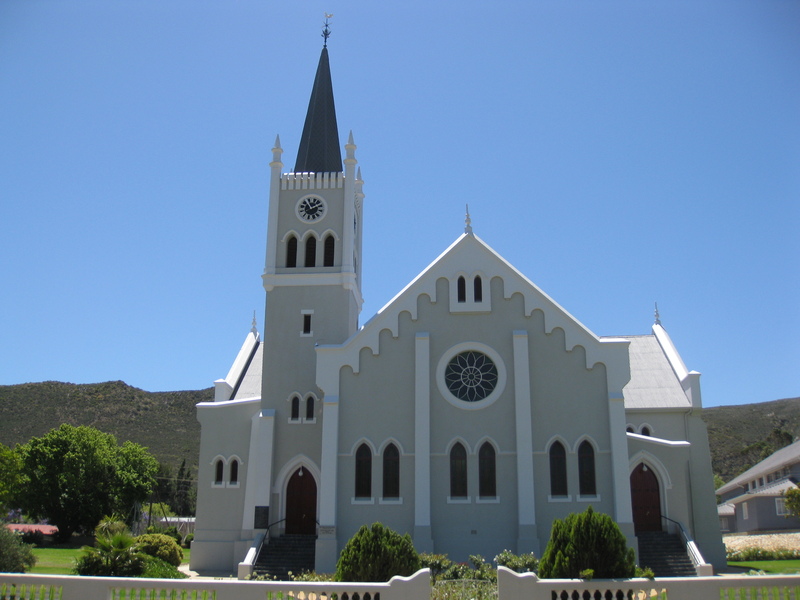 De Rust is located at the foot of the Swartberg Mountain range between Oudtshoorn and Beaufort West. 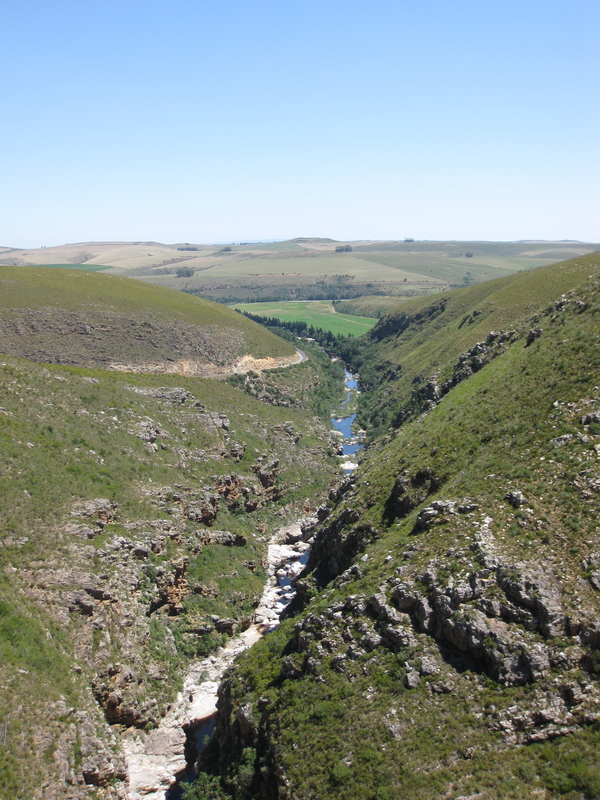 De Rust is also known for the meandering Meiringspoort pass. 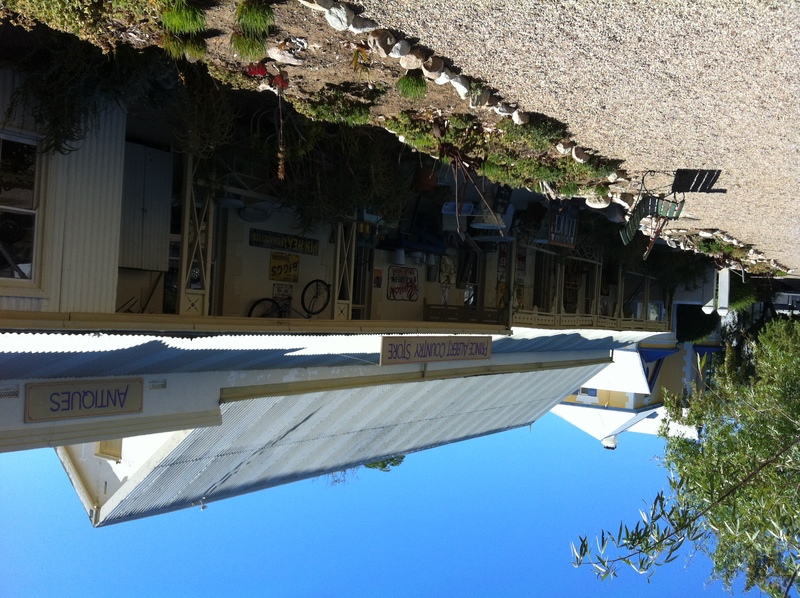 When driving through the streets of De Rust we noticed that almost half of De Rust was for sale, don’t know why since it was town of the year 2011 and is very quaint. 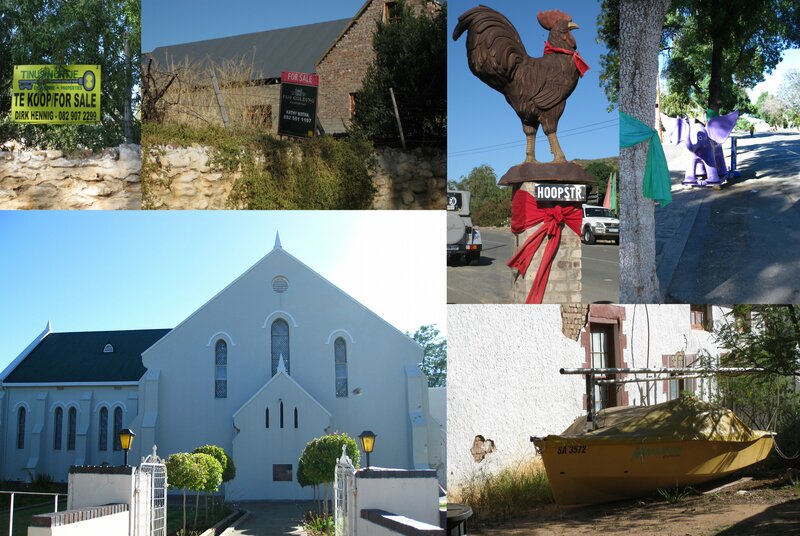 In De Rust we saw: a purple version of Herrie, a large cockerel (don’t know what the fascination with large scale animals is), many wire, mosaic and artistic crosses on peoples front doors and walls, a boat chained to a tree and a church on the hill. We then headed into Meiringspoort pass, which is a stunning pass through the numerous drifts with the red roak formations towering above us. 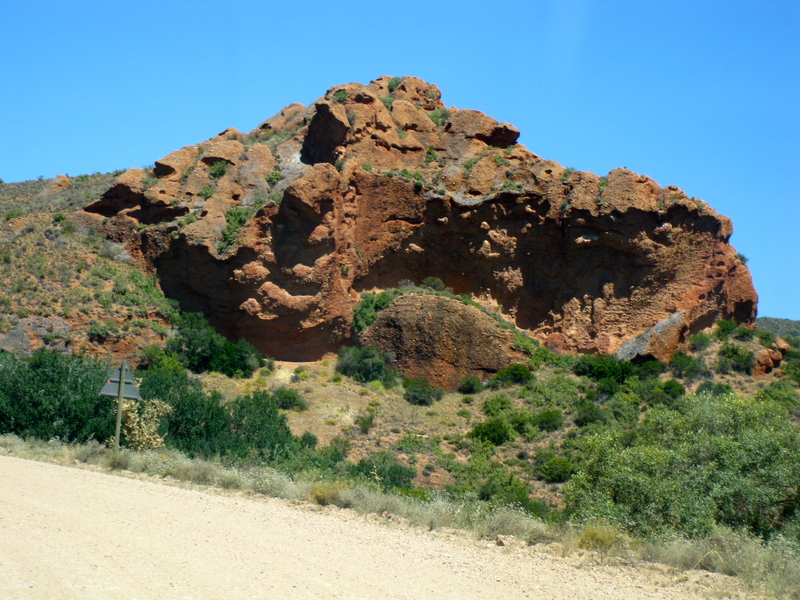 Meiringspoort is a gateway that connects the Klein Karoo and the Karoo through a gorge with a 25 km road crossing the same river 25 times in the span of the 25 km. Took so many pictures but none of then actually do it justice, you have to take a drive through this pass at least once in your lifetime. 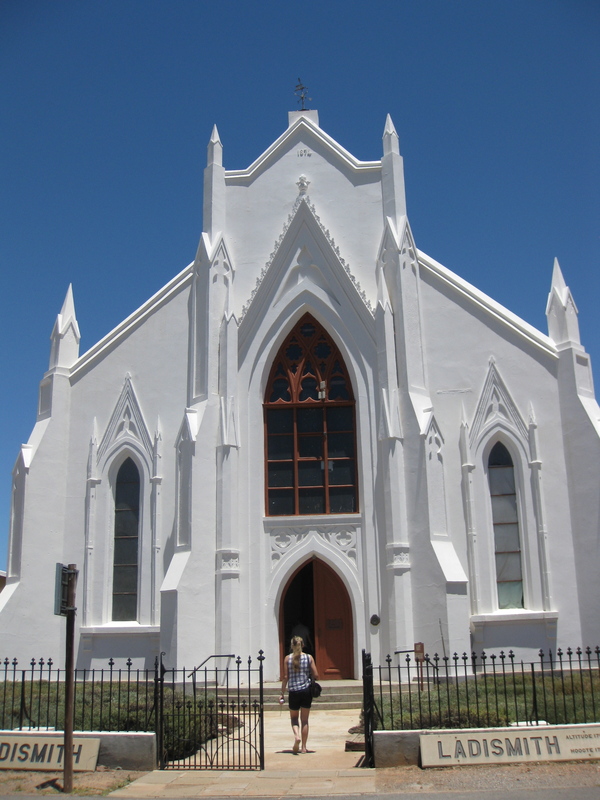 Out of the pass we drove onto Prince Albert for a drink and found a beautiful old church but struggled to just get a fruit juice. Very quaint looking place. Had a browse around the antique store and used their loo. 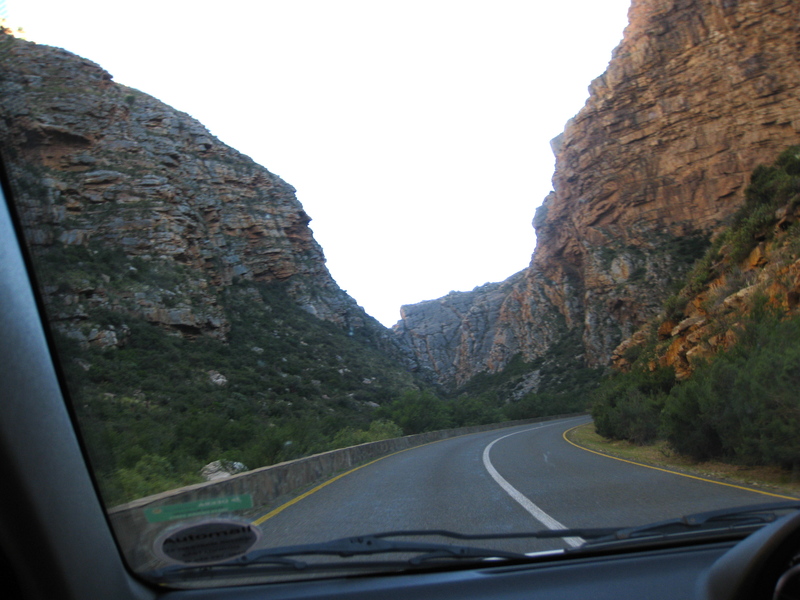 From Prince Albert we drove back to the Swartberg pass turn off and on the dirt over the pass, this was stunning. Got to the bottom of the pass and took the road onto Calitdorp, the road was tar until all of a sudden it was dirt for a long while, this went through another pass with huge red rocks. 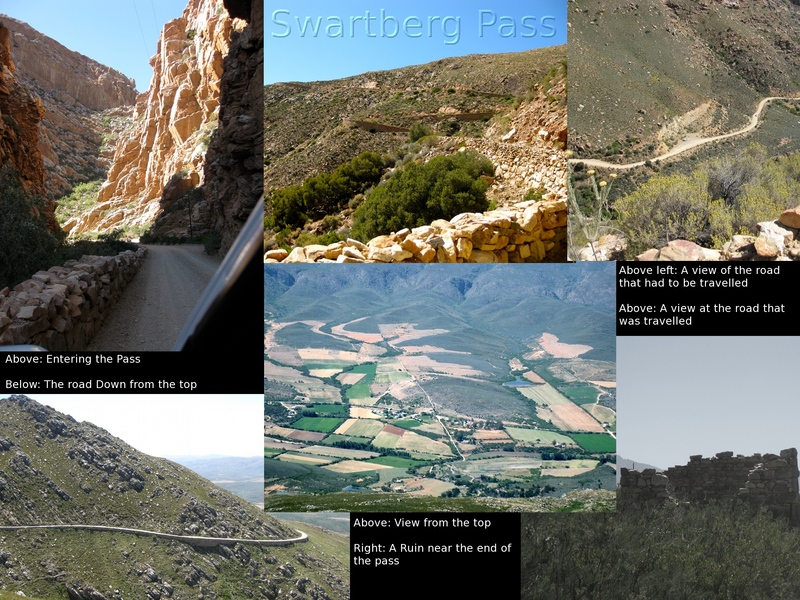 After Barrydale the road takes you through Tradouws pass and then past Swellendam and the over Sir Lowery’s Pass (the fact that the sea was so near was a bit of a surprise) and down into Somerset West and then into Cape Town. 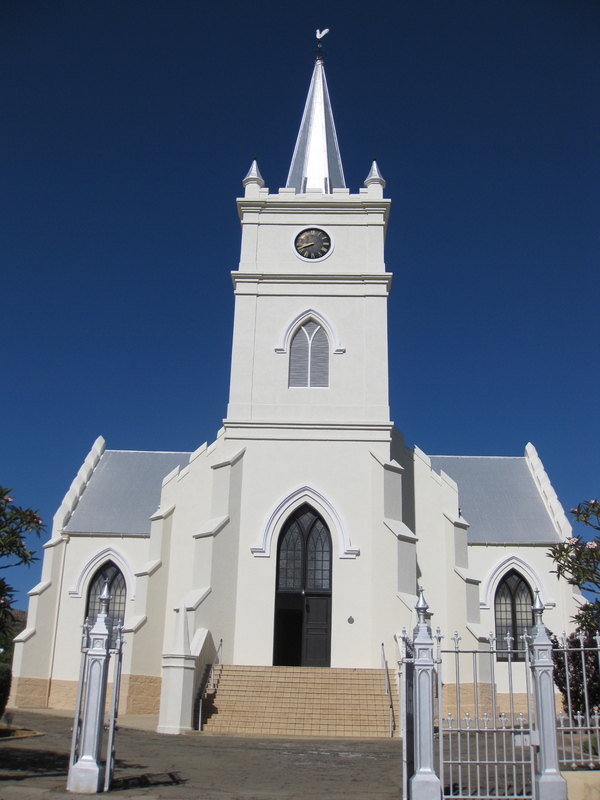 After the pass and 10 hours of driving we were a little tired and over it, the journey was great but we needed a destination and thus gunned it for Cape Town.